I was 17 years old when I began feeling the first effects of ENDO. As time has worn on and I have been through a rollercoaster of treatments and hardships, I have decided to dedicate my personal knowledge of ENDO to a website that will be helpful to all the women out there who suffer. "All we need is some support. Someone to hold us when the pain is bad, someone to wipe away our tears when we feel as if our insides are being ripped apart. Someone to love us no matter what becomes of this. We just need someone to understand"
....and that is the whole point of this website. It is here to educate and give a face to the pain, the agony, and the devastation that this horrible disease causes. My name is Ryan Elizabeth, I am 20 years old and I am a sufferer of the disease known as ENDOMETRIOSIS. I was diagnosed with having the disease in July of 1998, but I lived with the symptoms for 2 1/2 years before a diagnosis was made. Since my diagnosis I have made it a point to educate myself to the fullest about this disease, and during my fight to learn I have gotten so much information that I thought it would be helpful and useful to share it with everyone who wanted answers. The biggest question one asks when they are diagnosed is, "why me?" No one really knows why, or how ENDOMETRIOSIS happens. There are so many factors and so few doctors the answers are still unknown. The awareness of ENDO is really limited to "oh my sister had ENDO", or "I think I've heard of it." That really effects the importance of research for ENDO, research has come a long way in the last 100 years and luckily the subject of womens sexual health is steadily improving, but for the few of us who have this disease there still needs to be a lot more improvement! Click here for information about ENDOMETRIOSIS contains information about symptoms, shows pictures from an actual laparoscopy, and talks about ENDO itself. Has general information about MOST of the treatments used in the fight against ENDO. Lupron, Birth Control Pills, Surgery, etc. Talks about how I have managed to deal with ENDO, how I have dealt, and what I have gone through since before and after my diagnosis. 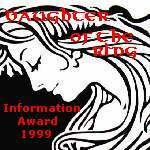 Daughter of The Ring Awards for Information and Soul , Study Web Award for Academic Excellence, 1999.